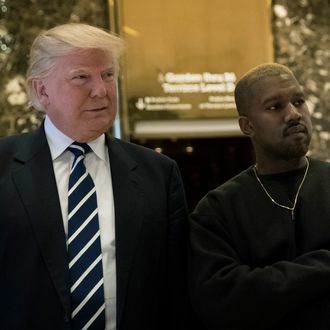 While West is living out loud and proud of his opinions, it would seem that Yeezy has not converted many fellow celebrities. Several rappers, singers, and others in the music industry responded to West’s latest social-media posts with criticism. Some, like Ice-T, were succinct in their responses. Other celebs made light of the situation. After West tweeted out several pictures of his mansion as proof that he is out of “the sunken place,” a reference to Jordan Peele’s horror movie, the filmmaker responded to the shoutout. Snoop Dogg also couldn’t shake the reference. Likewise, Scooter Braun, Kanye’s longtime manager who recently parted ways with the rapper, pretended to be unaware of West’s social-media activity. Lupe Fiasco had this zinger. Even Frank Ocean added his two cents with a pointed reminder of simpler times. Meanwhile, Azealia Banks just wants you to know she pulled a Kanye before Kanye.